Duodenal ulcer is a sore occurring in the upper area of the small intestine, the duodenum. Gram-negative micro aerophilic bacteria helicobacter pylori (H. pylori) are the causative agent. Common symptoms for duodenal ulcer include abdominal pain, pain or uneasiness in the upper abdomen, feeling of flabbiness, blood in vomiting and chest pain. Causative factors for duodenal ulcer are alcohol consumption, cigarettes smoking or chewing tobacco, improper eating habits, genetic factors and non-steroidal anti-inflammatory drugs. Duodenal ulcer diagnosis is done by esophagogastroduodenoscopy (EGD), X-ray of upper gastrointestinal and endoscopy of intestine. Treatment for the cure of duodenal ulcer includes use of antibiotics (amoxicillin, tetracycline), proton pump inhibitors (lansoprazole or esomeprazole), potassium-competitive acid blockers (P-CAB), antacid and H2-antagonist and ulcer protective drugs such as sucralfate. Factors driving the growth of duodenal ulcer market are H.pylori infection, change in lifestyle i.e. increase in the number of cigarette smokers, alcohol/tobacco consumers and significant increase food habits. Few medicines also cause this condition. This report provides information on duodenal ulcer treatment market size for the year 2014-2016, and forecast of the same for year 2021. It also focuses on market drivers, challenges, restraints, market dynamics, growth indicators, competitive landscape, potential growth opportunities and other key aspects with respect to duodenal ulcer. Globally demand for duodenal ulcer treatment is expected to witness growth due to increasing prevalence of the disease. North America and Europe combined and Asia Pacific alone accounted for 67% and 22% share respectively of overall market revenue in global peptic ulcer drugs market in 2014 and is predicted to add significant market share over the forecast period, due to increasing recurrence disease. 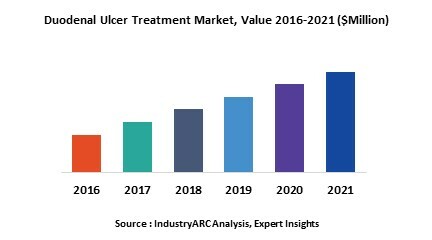 Duodenal ulcer treatment market is segmented based on different classes of drugs available for treatment: proton pump inhibitors (PPI), potassium-competitive acid blockers (P-CAB), antacids, ulcer protective drugs, H2-antagonists, antibiotics and surgery. This report has been further segmented into major regions, which include detailed analysis of each region such as: North America, Europe, Asia-Pacific (APAC), and Rest of the World (RoW) covering all the major country level markets in each of the region. 13.11. Ei sai Co., Ltd.